There are assignments as a writer that I gladly accept. 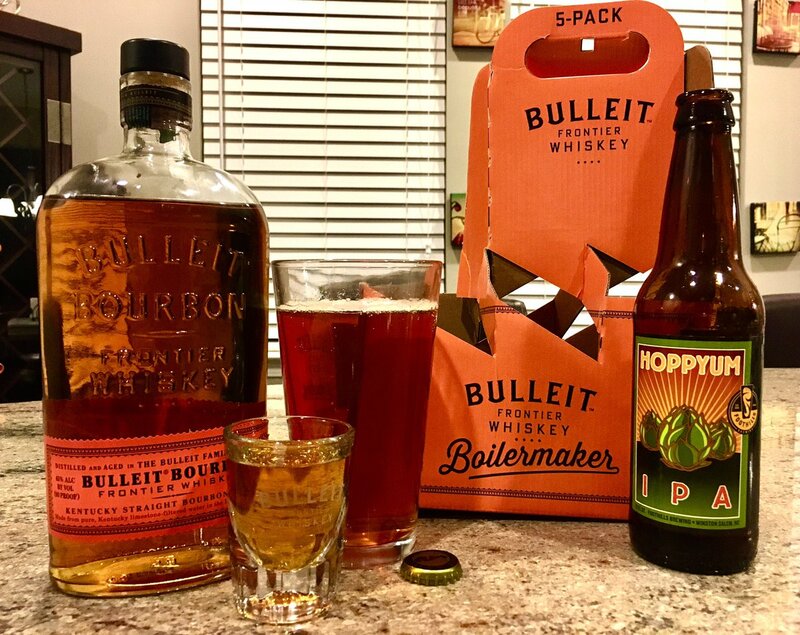 One of them recently was when the fine folks over at Bulleit Bourbon asked me if I was interested in finding the right beer to pair with Bulleit to create the perfect Boilermaker. Most of you know that a Boilermaker is created when you combine a cold beer with a shot of whiskey. There are few theories on when the Boilermaker was created. Some say that Boilermaker came to be in the 1800s when blue collar workers headed to the bar after a long shift and it is believed that the drink was named after the workers who built and maintained steam locomotives during that same time period. Another idea is that the first Boilermaker was created when Richard Trevitchick and his friends celebrated after his steam powered vehicle made its first successful climb up his village’s steepest hill on Christmas Eve in 1801. No matter how the Boilermaker came to be the popularity of the Boilermaker is making a comeback. So with that notion Bulleit is asking for my help and yours as long as you are 21 years old or older to find the beer that when paired with any variety of Bulleit Bourbon will create the best Boilermaker. Over the next few months I will be trying out a few local beers or maybe some national ones to see if I can find the best pairing. This month I am going with an IPA. The IPA is from Foothills Brewery in North Carolina. It is the Hoppyum IPA. This is IPA as Foothills says has nutty malts that lend a surprisingly sweet base to copious additions of tangerine-y Simcoe hops. Great aroma, superior taste, clean dry finish. It is the most popular beer and I thought I should give it a try with Bulleit. As I poured the IPA into the glass I was looking forward to seeing what it would taste like with Bulleit Bourbon. I pour a shot of Bulleit into a shot glass and then dropped the glass into the beer. I picked up the glass and drank the whole thing. I was really happy with the taste. The two complemented each other well. It was a strong first entry into the quest for the perfect Boilermaker. I would say that this one had a score of 7.5 out of ten. What is your pairing? Below is the recipe you can use. Let me know which beer you used with Bulleit. I’m always looking for some good suggestions. Print article This entry was posted by Art Eddy III on February 13, 2017 at 7:25 pm, and is filed under Lifestyle. Follow any responses to this post through RSS 2.0. Both comments and pings are currently closed.